Once again I am compelled to write a piece by a recent incident I was involved with, where the police were called for assistance by a tenant in difficulty and the tenant wished they hadn’t. In twenty-eight years of dealing with harassment and illegal evictions, I have had a fair amount of dealings with the Police and I have to say, most of my experiences have been dreadful. In the worst scenarios the police actually help the landlord to carry out the illegal eviction, thus committing a criminal act themselves, and in one memorable case I had, a 63 year old man was punched in the face twice by the letting agent and when he reported this to police they told him it was a civil matter. Since when did a violent assault become a civil offence? Although the tenant did, in fact, make a successful damages claim later on. A row over a new tenant moving in whilst the real tenant was still in occupation the police actually helped the new tenant carry her boxes upstairs to the flat while the real tenant, who had been assaulted, was taken away in an ambulance and when I phoned the police station for a report, the officer’s hadn’t even logged it as an incident, even though they were there when the ambulance took her to hospital. I once tried negotiating in an eviction in progress and the landlord said that if he was forced to let the tenant back in he would burn the house down with her in it. I called the police on the death threat issue, secure in the knowledge that at least I was on site and could prevent things going belly up. I groaned and had to ask him to step outside while I explained again. Police have even faced legal action themselves for this kind of thing. In the 2010 case of Naughton v. Whittle & Chief Constable of Greater Manchester Police the force had to pay Mr Naughton £2,500 for threatening to arrest him when called to an illegal eviction in progress. Various helpful websites advise people being illegally evicted to call the police straight away, which is quite frankly the last thing I would advise. Yes, they can provide useful reports and CAD numbers confirming an incident but there is always the risk that the tenant will be worse off for making the call. The confusion arises of course because whilst harassment and illegal eviction are criminal offences under the Protection from Eviction Act 1977 – it’s the council that prosecutes under this legislation, not the police. Well clearly educating the police, but what are the problems in practice there? I’ve tried forming good working relationships with individual and helpful inspectors, sergeants and officers but they never stay in their roles for long and once they get moved onto drug squad or Operation Trident, your links are gone. I’ve trained large groups of inspectors at their Met Police training venue in Victoria, in the hopes that being reasonably senior the knowledge would trickle down wherever they were posted. It didn’t. With the help of a borough commander, I was put in touch with the education head at the police college, offering free training on the matter so all new officers would be up to speed from day one. They never responded to any emails I sent. I offered, again free of charge to create an app to accompany an existing product the Met uses called “iPlod” ( I kid you not) that covers information on a range of problems. Again no take up. Eventually, I was forced to go down the road of polite but firm coercion. I met with our local borough commander and pointed out that his officers were routinely committing criminal offences and that as the prosecuting officer for the local authority it was getting to a point where I would have to start carrying out interviews under caution of his people. Suitably horrified he arranged for me to train his crew every 6 – 8 weeks as new ones came in, teaching how to spot an illegal eviction and some basic tenant’s rights. In building and maintaining a working relationship, keyed into the senior officer it completely eradicated the problem. Every time a tenant with a problem called the police they were properly advised and signposted to the right people. That was just one initiative and I’ve heard other council’s having similarly successful partnerships like that but Initiatives based on a borough by borough basis is not an efficient way to deal with the issue. It really is something the police nationally need to get on top of. Complaints of this kind are reported regularly by people across the UK charged with dealing with harassment and illegal eviction. It should not be the case that police, who are employed to serve the community, should be giving such drastically wrong advice and even committing criminal acts themselves out of their own ignorance. I am not the only enforcement officer that I know who is more than happy to provide free training but trying to just get people in the police who hold the right positions to talk to you is an uphill struggle. Of course, another alternative is for enforcement officers involved in cases where the police assist in an illegal eviction, to lay charges against them, But it shouldn’t have to get to that. Although it may have to. There’s no colluding, no conspiracy, no landlords secretly plotting with chief constables behind closed doors. The police can’t be expected to know the minutia of every law in the land, so they have to use their common sense judgement. Outside the rarefied world of housing law, 99% of people are horrified rogue tenants can legally steal the rent, trash properties and make their neighbours lives hell with impunity. The police are just a reflection of the society they represent. Nice to see the thought police engaging in reasoned debate. You’ve brought no reason to your argument you literally think that the police shouldn’t be expected to know the law and that they should use common senss. To be a police officer you have to have training in the laws they are enforcing. I can guess which forum grouo you’re from. That is an odd comment to make. The Protection From Eviction Act is hardly an arcane piece of legislation; it’s been the law for quite some time and is really quite straightforward. And, much of the post above is about Ben’s attempts to help the Police to understand the law or to place it literally at their fingertips. Would you be happy if, summoned to assist at a lawful eviction, the Police allowed a landlord to be violently assaulted, then prevented the bailiffs from carrying out the eviction? Or would you say that they couldn’t be expected to uphold the law, with an airy wave of the hand? What’s sauce for the goose is sauce for the gander. Finally, since when has an assault so serious as to require an ambulance to be summoned been the minutiae of the law? Jon, the police didn’t allow the tenant to be violently assaulted. They arrived after the incident. The landlord also turned up after the incident. There had been an altercation between the old tenant and the new tenant moving in. No allegations of assault were made against the landlord. There was a possession order for the property but the old tenant still hadn’t moved out and there was no warrant of eviction. The old tenant and landlord don’t speak English as a first language and one of them is hysterical and threatening suicide. Oh, and there is a disabled asylum seeker that comes into it somehow. The police then have to sort that lot out. Yes, quite simple. All the stuff about asylum seekers is offensive nonsense. In the fictional example you suggest, the landlord is seeking to carry out an illegal eviction. He should be arrested and prosecuted. Dunno if it is fictional or not Jon, but I doubt it. Ben has consistently been saying the same story for the best part of a decade. The police seemed to me to have behaved fairly and reasonably in the circumstances. I’ll see if I can find a link to the original story. No idea why you find mentioning asylum seekers offensive. Well even if we have it would be totally irrelevant as this is a UK website and is not concerned with what may or may not happen in America! Seems line you let them off easy. 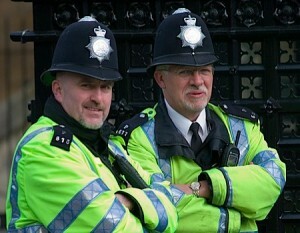 Why should police be treated any differently than a few of the landlords burly mates. If anything police should be held to a higher standard. Lewis, I wholeheartedly agree. I have been dealing with this sh*t for 28 years and my frustration is beyond compare but an enforcement officer cant mount a prosecution of the police on their own. They would have to walk into the council’s legal department and promote the idea that you suggest. I dont think you have to be a council worker to guess the facial response. So you have to find creative ways around it, such as I have tried above. Even writing this article is another attempt, however small, to rattly some cages. As I point out localised initiatives can be achieved but they are no alternative to the national police forces of this country recognising that their officers are involved in criminal activities as a matter of routine. Does the Council have a duty to take action against those involved in illegal eviction or only a power? Money talks. You refer to the case involving GMP above; I submit that if these cases were to result in serious awards of damages in many cases, then they would be taken much more seriously by senior management. Incidentally, is there any benefit in an approach to Police and Crime Commissioners, or the equivalent in London? Its not the money so much Jon, its the council’s legal teams, who would be horrified at the thought of moving on the police, it wouldn’t get past first base. Even if there were gung ho maverick in the team it would get picked up further down the line by a nervy head of service or departmental executive. Going to the Crime Commissioners is a relevant suggestion., The question is then, how do you make the approach? As an individual? as a council? I doubt you could just knock on their door.or that they would take an issue seriously without supportive stats. Tweet from Tom Copley (Labour London Assembly member) today 05 April in response to reading this..
Good luck with that Tom, it happened 7 years ago. In and ideal world, the quickest way for the police to learn and instruct their officers are for a coordinated effort by local authorities nationally to lay charges against officers for the criminal offence being committed. You can bet individual forces, ACPO, College of Policing etc. would pick it up and teach their officers in a hurry.